This article is about the Connecticut smasher. For other uses, see Light (disambiguation). Light is a professional Super Smash Bros. Ultimate Fox main from Connecticut, considered the best Fox player in the world. He has taken sets off of Tweek, MkLeo, Dabuz, Nairo, Salem, ESAM, MVD, Charliedaking, and Mr.R. He is currently ranked 1st on the Connecticut Power Rankings. In Super Smash Bros. for Wii U, Light was also a Fox player, and is also considered one of the best Fox players in the world along with Larry Lurr. 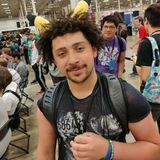 He has taken sets from Tweek, Dabuz, Nairo, Cosmos, Mr.R, VoiD, komorikiri, and Larry Lurr. Light is currently ranked 1st on the Connecticut Smash 4 Power Rankings, 2nd on the NER 2017-2018, and 43rd on the Panda Global Rankings 100. On February 8th, 2018, Light was signed by Most Valuable Gaming. Months later, on September 26th, 2018, MVG released Light from his contract for unknown reasons. On February 21st, 2019, Light was signed by Rogue. This page was last edited on April 21, 2019, at 16:18.